I am not the most knowledgeable when it comes to the identification of wild mushroom species, but that fact is on the fast track to becoming untrue. Every time now that I take a wander through any remotely wild space, I have my eyes peeled for not just plants but also mushrooms, as I have developed a recent fascination with them over the last 2 years or so. I realized that they were around and played an important ecological roll, but never made an effort to decode and demystify them. I am observing and learning to recognize many of the common and regular species better now, and this species is the one that I learned about and got the most intimate with this week. A typical young cluster of cracked-cap agrocybe, with the edges of the cap only starting to turn up and the surface developing cracks. 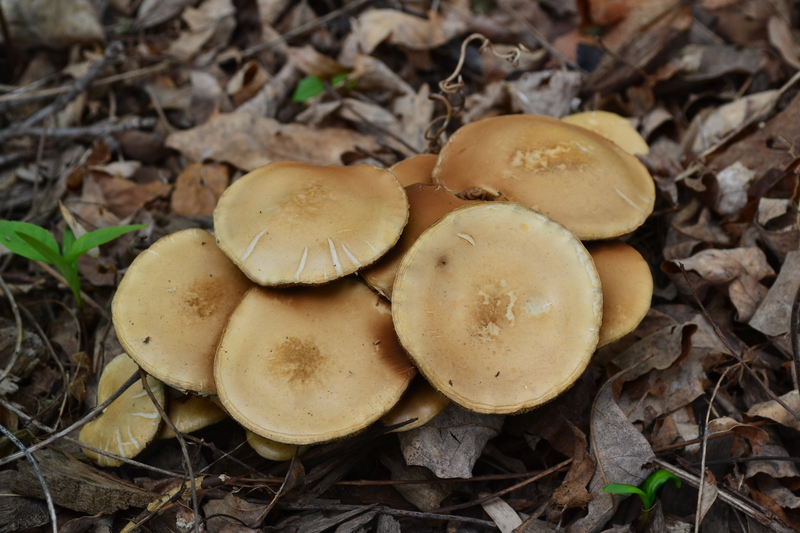 Agrocybe dura, also known by some taxonomists as Agrocybe molesta, is sometimes considered a subspecies or variety of Agrocybe praecox; the early agrocybe. Don’t be too alarmed if you didn’t really understand that last statement. All you really need to take away from that is that no one really knows how this species, or group of closely related but anatomically variable species, should be treated taxonomically. So for the purpose of this article, I am going to focus on A. dura / A. molesta and refer to them both as the cracked-cap agrocybe. The English name seems to be more consistent that the scientific names, which is backwards compared to the way many plants, and I’m sure many fungus species as well, are regarded in the common light. Some paler specimens with my hand for scale. It appears that the caps retain a darker patch in the center. I have encountered this species only a few times, but it is quite characteristic. These mushrooms often emerge in congested clusters or fairy rings, sometimes also as single individuals or small groups, in early to late spring typically following periods of rain (the species or complex name praecox means ‘early’). 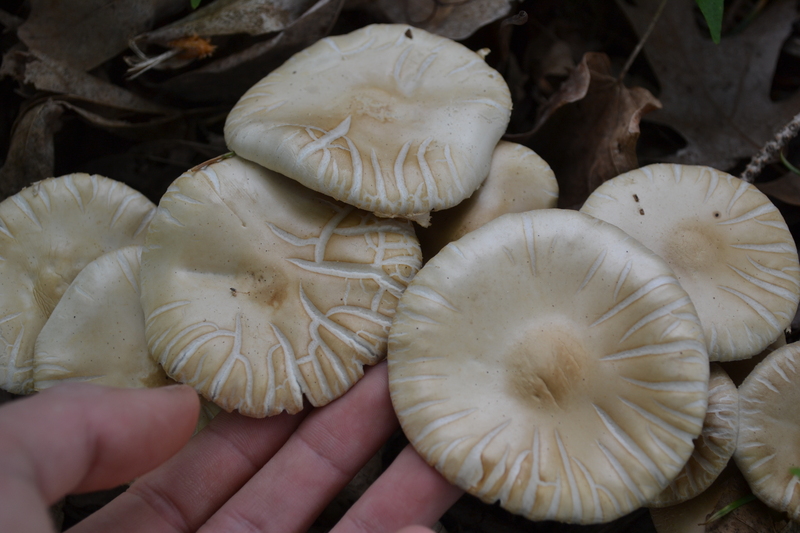 The mushrooms are buff to tan or beige colored and darken with age. The caps are at first smooth and dome shaped but flatten out and soon become concave, with the edges of the cap turning upwards. 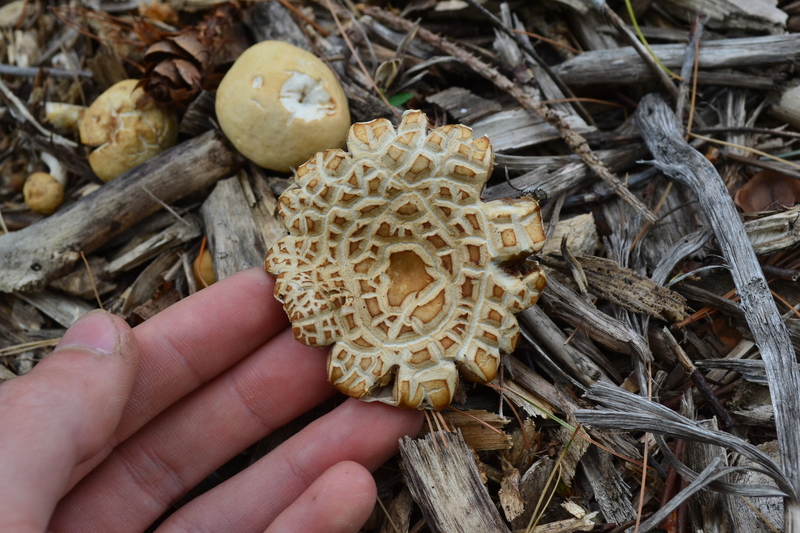 The caps also crack and split over time, creating a very characteristic blocky pattern when over-mature and beginning to rot. Gills are light to cream colored and darken to a deep cigar color. The base of the stem is somewhat bulbous and bears strands of rhizomorphs (mycelial ‘roots’). A solitary older specimen with an extraordinarily broken cap. The edges develop an interesting cog-wheel shaped pattern, but this doesn’t always occur. In case you are wondering, this species is described as being edible, but as with many things, edibility does not under any circumstances guarantee palatability. The cracked-cap agrocybe is apparently quite mealy and bitter when cooked, making it something that would help you to cheat death in an emergency situation but wouldn’t make you rave about it’s delicious taste and appealing texture at your next social event. The smell of the fresh mushroom is quite pleasant to me, but to others is described as resembling flour or stale oatmeal. Either way you look at it, this species should probably be treated as food only by those who really really need food. For the rest of us, it is food for the eyes and mind: beautiful and articulate to observe in person and be reminded that complex interactions and relationships between living things exist all around us, even in the middle of city parks. Nature and ‘natural’ of never far away, and could be interpreted not as a physical place but as a state of mind. 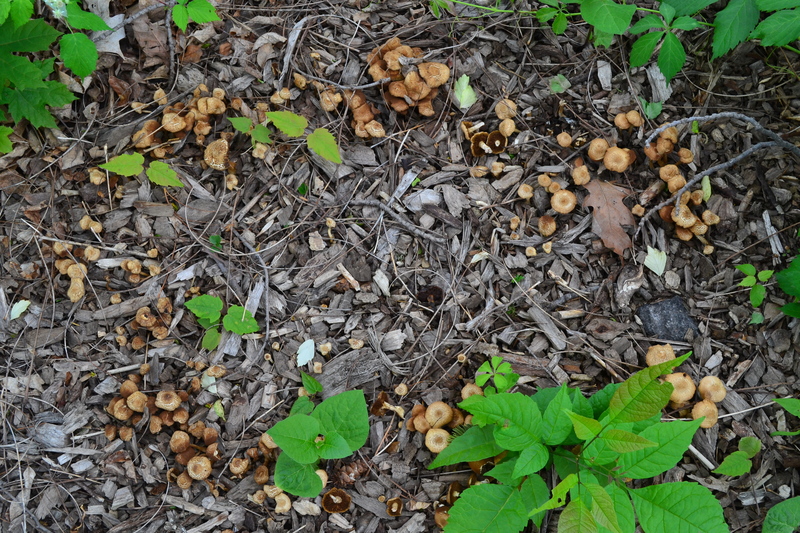 A fairy ring of cracked-cap agrocybe mushrooms in various stages of development. This habit of mushroom is not as uncommon as it may seem, and is observable in a wide variety of unrelated mushroom species.